Each guestroom features plush down duvets, 300-thread-count bedding, slate-tiled baths with backlit mirrors and sbe’s signature Ciel® bath amenities, a high-definition flat-screen television, and WiFi. 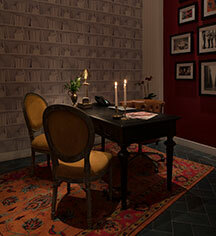 There are three different Roman inspired venues from Danny Meyer’s Union Square Hospitality Group on-property. Savor a thin, crackly-crusted pizza made with fresh, seasonal ingredients at Marta, the Roman-inspired pizzeria, sip an earthy espresso accompanied by a traditional Roman breakfast sandwich at Caffe Marchio, or fancy a bubbly aperitivi with crispy antipasti at Vini e Fritti. Guests can maintain workout routines with daily passes to New York Sports Club and pets are welcomed to stay. 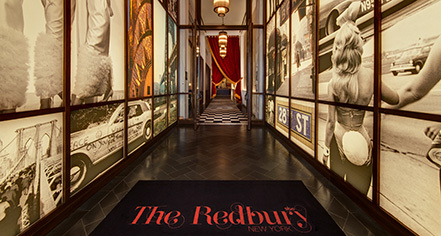 The Redbury New York, a member of Historic Hotels of America since 2016, dates back to 1903. Hotel/Resort Fees & Taxes: A Hotel Service Fee of $30 per day, per room (plus tax) will apply to booking. The fee includes: WiFi access throughout the entire hotel, access to digital copies of The New York Times and The Financial Times while on property, coffee service in the lobby, evening turndown service upon request, printing of incoming faxes and boarding passes, unlimited local and toll free calls, copy services, notary services, map of New York City, and daily passes to New York Sports Club.